One of the amazing things about movie characters is their unlimited supply of vehicles. The protagonist’s car blows up? No problem! There’s always another car at the ready, and it never requires insurance or a trip to the vehicle registration office. Chan is a shrewd fellow who can outsmart the best of ’em. (Really, it’s a wonder anyone dares commit a crime in San Francisco.) His crime-fighting resources consist of an ever-present hat, taxi fare and a brain that never shifts out of overdrive. About today’s movie: Chan is not played by a Chinese actor. Noooo. Instead of hiring an actual Chinese person, the producers signed the uber-annoying Sidney Toler. Still, you have to hand it to Toler; as Chan, he has a certain charm and never once slips out of character. Even his slow, deliberate walk is consistent. Toler, incidentally, appeared as Chan in over 20 Charlie Chan movies from 1938-47. In total, there were 44 Charlie Chan movies made from 1925-1947; Toler made five alone in 1944-45. You’re likely wondering about the plot! The family of a man who was murdered six months earlier, approaches Chan because they are frustrated with police. The strange thing about the murder is that the man was killed in a room that was locked from the inside. Chan tells the family he’s leaving on a trip in 48 hours but he’ll solve the case before he has to pack. Chan is no slouch, so we’re confident he can easily do in two days what the police couldn’t do in six months. Chan is aided by his eager Number Three Son, played by Benson Fong. An exasperated Chan continually pleads with his son to stop helping, but the son won’t hear of it. He’s determined to help his old man Get To The Bottom Of This. One of our favourite characters is taxi driver Birmingham Brown, played by comedian Mantan Moreland. Brown is the man with the infinite taxi supply, and is always available for Chan & Son whenever they need a lift. Although Moreland’s character is a stereotype (he says “Mmm, mmm, mmm” when he’s displeased) he’s an expert at both the physical comedy and stealing scenes. We’re not certain if we recommend today’s movie due to our aforementioned aversion to Sidney Toler. 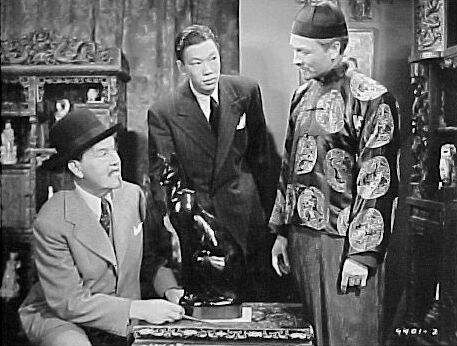 But if you like a smarty-pants detective – or, heaven forbid, Sidney Toler himself – then you should see Charlie Chan in the Chinese Cat. Charlie Chan in the Chinese Cat: starring Sidney Toler, Joan Woodbury, Mantan Moreland. Directed by Phil Rosen. Written by George Callahan. Monogram Pictures Corporation, 1944, B&W, 65 mins. I don’t follow the Chan series very well, but why is he the Number Three Son? Did sons one and two get killed off in previous installments? Oh boy, that is a a good question. I’m not sure what happened to One and Two. Will have to investigate. Ha – 47 movies would make for a very easy programming director’s job indeed. I can see why a person would fall asleep during these movies, especially if viewing them late at night! Thanks, Dor. I hope you get the chance to see – and blog about – some of the Chan movies. I’d love to see your screencaps and photo captions! Heh. Toler is not my favorite Chan either, Ruth (though he appears in some cracking Chan films, like CC IN CITY OF DARKNESS). I prefer the gentler Warner Oland. He still manages to insult the foolish without seeming so direct about it (and I prefer No. 1 son Keye Luke in those films, too). The earlier Chans (before Toler and company ended up at PRC Studios) are great fun. The less said about Roland Winters, the better. And you’re right about Mantan Moreland, scene stealer extraordinaire. Mantan Moreland is the best thing about this movie. It’s too bad the movie couldn’t be told from his point of view. Ha – I loved your comment: “The less said about Roland Winters, the better.” I’ve not seen Mr Winters as Charlie Chan, but I’m very curious about it now. I find Toler acceptable as Charlie Chan–not as good was Warner Oland, but better than Roland Winters. Some of his earlier films are pretty fun, but the latter ones lost their charm. You are so right about cars in movies! I liked in the scene in THE PURPLE ROSE OF CAIRO where a character “steps out” of a movie and tries drive a real car–without the keys. He doesn’t understand why it won’t move! Ha ha! I forgot about that scene in “The Purple Rose of Cairo”. That was good. I haven’t see any of the Warner Oland movies, but he seems to be the fan favorite. I’ve put him on my must-watch list. Oh, you gave a me a great laugh! It is so true that there is always a car when you need it in the movies. maybe someone should make a movie about NOT being able to get a ride! Great post. What a great idea for a movie! It would make for a fabulous quirky, independent film. Fun review! I enjoyed your comments about Sidney Toler. By the way, Benson Fong will show up in Family Affair Friday two weeks from now. Ooh, I’m looking forward to seeing the kind of role Benson Fong has on “A Family Affair”. I’m a huge Chan fan, and pretty much enjoy them all, to various degrees. Heck. I even like Roland Winters, though I agree that the best part of the Monogram titles is Mantan Moreland. 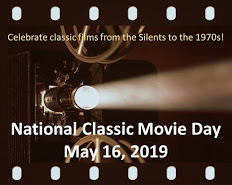 Some of the Fox titles have great atmosphere, such as “Charlie Chan at the Wax Museum” and “Dead Men Tell.” There are far worse ways to spend time. If memory serves, Number One Son Lee (Keye Luke) was away at college when number two son Jimmy (Victor Sen Yung) stepped in. In some of the Monograms, like “Charlie Chan in the Secret Service” and “Meeting at Midnight” Chan’s daughters lend a hand. In the series’ penultimate film, “The Feathered Serpent” both Number One and Two Sons both appear to help Pop. Thanks for all the info, Kevin. I’m not that familiar with the Charlie Chan series as a whole, but you’ve made a great sales pitch. 🙂 I agree with you — there are worse ways to spend your time. I love reading your blog because I always learn so much about films I haven’t seen. I guess I’ve led a sheltered life as I’ve never seen a Charlie Chan movie. You have definitely made me want to watch one to see what I’ve been missing. Thank you, Ruth! These movies will never make any AFI Top 100 Lists, but they are entertaining. It’s an interesting view of 1940s cinema and Hollywood’s attempt at “cultural diversity”. I’ve never seen a Chan movie. Is this the one to start with? I’m not that familiar with the Charlie Chan franchise, but I think this is a pretty good one to start with. However, the Warner Oland Charlie Chan seems to be the most popular with classic movie fans. Oland was Chan before the insufferable Sidney Toler was cast. Just watched a few Toler Chans the other day as it happens – in Panama & Murder Cruise. Chan is a kind of movie comfort food for me.